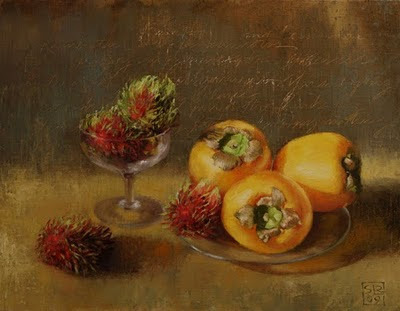 Persimmons and Rambutans, oil on linen stretched over panel, 11" x 14"
This painting appeared, slightly cropped, on my Christmas card this year. Like last year, (that entry here), I was tempted to document the almost outrageous abundance and variety of food at this time of year. Here, in a medium sized city, in the dark and cold midwinter, I can walk downtown and return home with almost any fruit or vegetable I can name. So much for the seasonal and local mantra I find so easy to adopt in the summer. I'm not complaining--five months of root vegetables and increasingly soft apples is not a past I want to return to, but I wonder how long it can all last. I wish us all continued abundance (you choose the form) in the New Year. Is this painting for sale? I love it. Thanks Melissa. Yes, the painting is available. Please send an email to contact@parlour.ca if you'd like more information.